The deions of the alpinist routes have always evoked the whirlwind of feelings in my soul. Written by the first ascenders of 2, 3-grade routes, they are large, full of the difficult places and mistakes. The rocky Crimea started for us, alpinists of the team МВТУ, when the alpinist gear was actively developing. Kilse-Boroon, Kush-Kaya by 2 and 3-grade routes, then " Рыбка " (Fish) - our first 5-grade route. We sent all known wall routes on Aya and Kush-Kaya. We decided to give the deions of the routes in this region with our recommendations. № 10 Kush-Kaya. Big камин по the right стене (Big chimney along the right wall). 4 grade. Go100- 120 m along the slabs and the ledges of the cup to the direction of the tree, growing under the base of two parallel cracks. From the tree ascend 15m along the left crack to the tree, where the crack bifurcates. Then go to the small break and then go to the left and upwards to the small ledge with a tree — R6. From the ledge go to the right, then ascend 15- 20 m to the cornice and, bypassing it on the left, go to the tree on the ledge with white spot — R7. Another variation of this section: from point R6 ascend firstly to the left, then upwards along the crack, leading to bypass of the cornice. This variation is more difficult in belay aspect. But the easiest variation is to bypass the cornice on the right and climb on " варежку " ( Mitten ) by the easy (III climbing) corner. From R7 go upwards 20 m along the right crack and further along the small chimney to the tree — R8. From the tree go upwards by the easy rocks 15 m to another tree — R9 and then go upwards and to the left to the big cornice. Ascend along the crack to the small a bit overhanging chimney — RIO. Go upwards along the chimney, using the placed bolts, and then along the cracks and the corner go to the tree — RII. From the tree go to the right by easy rocks or go upwards by the destroyed 5-m chimney to the plateau. 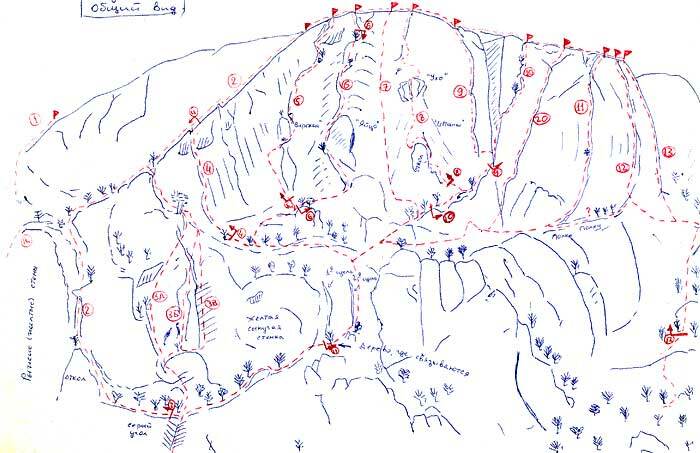 * There is a variation of the upper part of the route from R9 to the right through the big cornice (R10', R11').
" второе футбольное поле " (second football ground) - a wide ledge with trees in the middle of the wall. серая чаша gray cup - wall between "the 2-grade ridge" and central buttress of the wall. «Варежка » (Mittens) - rock in form of a mitten.